Iris winterised the garden in autumn with a good covering of pea straw. This has slowly broken down and now we double pass rotary hoe the straw and soil. 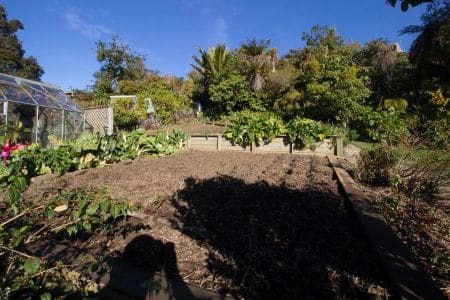 Although the soil was quite damp it whizzed up well, and the few days sunny still days allowed quite good drying. But of course we get lots of rain days, so after the rotary hoeing we cover the soil with a black polythene cover whenever rain is expected. This keeps the rain off the soil and of course black absorbs heat whenever the sun shines between showers. When the forecast is good we roll the covers back. We don’t get much in the way of frosts, but what we do get help with slug and bug control, so we uncover when we expect a frost as well. Slugs can be an issue here, as the few frosts we get don’t have much impact on survival. 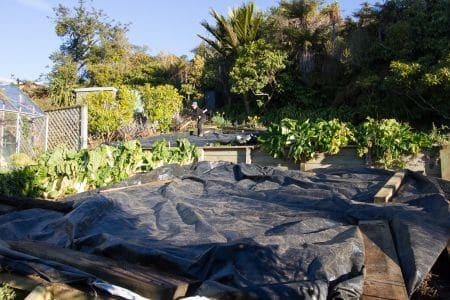 Iris does not use slug bate, and with poor climate control she has lots of flat boards around the garden for Slugs to hide under this during the day. A daily chore is clearing all the boards. Reducing the adult population also means far fewer eggs available in the spring. Covered !! The timbers keeps the cover down in wind. 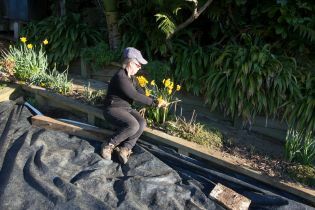 Iris pruning her grape vine. 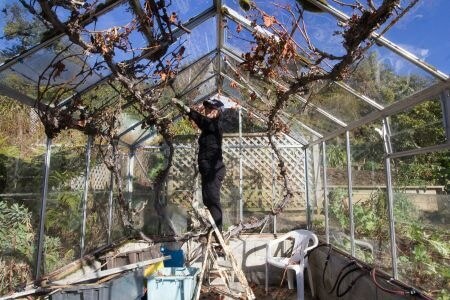 A few days ago I was talking with Sue from Clearview Lodge and she mentioned starting pruning her vineyard, a big job and will take her several days. Our single vine needed pruning as well, but only a few minutes work. Our mild winter has started bud forming quite early, and Iris is hoping that the vines don’t bleed.